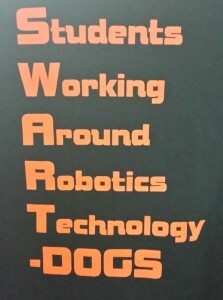 FIRST Team 525, The ‘Swartdogs’, is a FIRST Robotics Team founded in 1999. The Swartdogs consist of students from the Cedar Falls Schools and mentors from the Cedar Valley Area. Our goal is to inspire students’ interest in science and technology. We strive to be competitive each year, while living out the values of Gracious Professionalism that are so important in FIRST Robotics. FIRST Team 525 has been built following the principles that are at the core of FIRST. FIRST Team 525 even has added their own rule – the “Grandma Rule”. The “Grandma Rule” tells us not to do or say anything we wouldn’t in front of our grandmothers. It has been one of the guiding rules for the team. We believe in Gracious Professionalism and are known to frequently help other teams. We have helped FRC, FTC and FLL teams. It all began when high school physics teacher Kenton Swartley was trying to find another way to show applications of physics. He showed a video of a FIRST competition as an example. After class, Mr. Swartley was approached by several excited students who wanted to start a robotics team. Realizing the challenges that came with starting a team, he outlined the steps that would be necessary to begin, and promised that if they could recruit students, find mentors and raise the entrance fees, he would be happy to present the idea to the faculty and organize the team. Their enthusiasm didn’t fade and the team was born. They raised funds from small businesses and convinced engineers and other parents to become mentors. Parents donated everything from meals to power tools. Mr. Swartley fulfilled his promise and led the newly-founded ‘Swartdogs’ to Championships in Orlando, Florida. After an exciting rookie year, the team struggled in its second year. Fundraising in the Cedar Valley was difficult. While able to secure funding to continue to build, program and test, funding fell short of goals to travel and compete. While disappointed, the team continued to progress and learned valuable lessons for the future. By the third year, the team was back on track, with resources identified for both the build season and travel to a regional. From its humble beginnings, the team gradually changed the culture of the student community. Students are more motivated in science and math classes because they have the opportunity to directly apply the concepts presented in the classroom. Our team is very involved in many activities. Since 2008, we have sponsored an FLL Regional Qualifier and since 2012 it has included a FLL Jr. expo. We also help provide technical and programming help to our local FLL and FTC teams. Throughout the year, we hold other demonstrations for schools in our city as well as other communities. These activities help build interest and excitement in STEM. We are very thankful for the all of the mentors on our team. They help and show us how to do the tasks at hand, but it is up to us to actually do them. Our team has five Woodie Flowers Award winning mentors.